If you desire to “do it all” on your Antarctic adventure, then this is the voyage for you. Not only will you cross the Antarctic Circle and travel further south than traditional Antarctic cruises, you’ll also visit the wildlife playgrounds of the Falklands and South Georgia. This journey is for anyone who appreciates a wide variety of landscapes, unprecedented wildlife viewing opportunities and a healthy mix of historic landing sites. 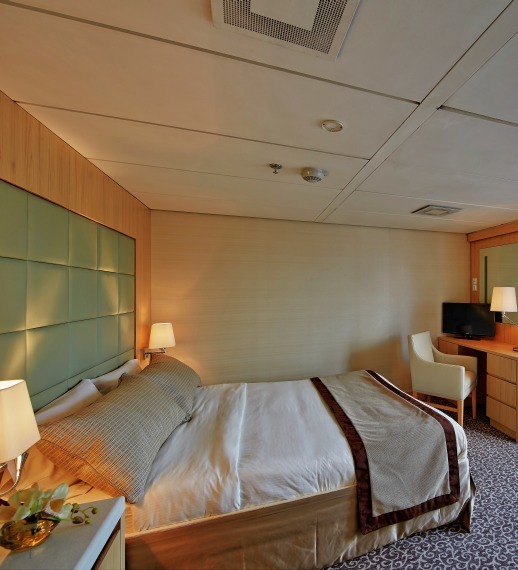 Approximately 200 square feet (19 square meters) in size, this cabin has a two twin beds and an upper bed, and two portholes (Note: cabin 332 has three lower beds). Located on the Lower Deck, this cabin has a private bathroom with bathtub and shower. Approximately 200 square feet (19 square meters) in size, this cabin has one double bed or two twin beds, and a picture window (the view is obstructed). Located on the Captain’s Deck, this cabin has a private bathroom with bathtub and shower. Amenities include: wardrobes, drawers, flat-screen TV, DVD player, individual temperature controls, in-room safe, refrigerator, satellite telephone access, and hair dryer. Between 183 and 200 square feet (19 and 17 square meters) in size, this cabin has one double bed or two twin beds, and a picture window. Located on the Upper and Main Decks, this cabin has a private bathroom with bathtub and shower. Between 200 and 183 square feet (19 and 17 square meters) in size, this cabin has one double bed or two twin beds, and a picture window. Located on the Upper and Main Decks, this cabin has a private bathroom with bathtub and shower. Approximately 325 square feet (30 square meters) in size, including the balcony, this suite has one double bed or two twin beds, and a full-size window with a sliding glass door that leads to a private deck with chairs. Located on the Observation Deck, this suite has a private bathroom with bathtub and shower. Approximately 200 square feet (19 square meters) in size, this cabin has one double bed, and a picture window (the view is obstructed by the lifeboats). Located on the Captain’s Deck, this cabin has a private bathroom with bathtub and shower. Approximately 200 square feet (19 square meters) in size, this cabin has one double bed and two portholes. Located on the Lower Decks, this cabin has a private bathroom with shower. Amenities include: wardrobes, drawers, flat-screen TV, DVD player, individual temperature controls, in-room safe, refrigerator, satellite telephone access, and hair dryer. You will begin your journey in Ushuaia, a small but bustling port town at the tip of South America. This Argentine town is an ideal gateway for you to explore the southern extent of Patagonia while preparing for your adventure ahead. Get active in the mountains or enjoy handcrafted chocolate at a café in town. As the ship sets sail in the late afternoon, you will begin your Antarctic journey, passing through the Beagle Channel. Named after the famed ship on which Charles Darwin voyaged, the channel presents great photo opportunities to capture seabirds hovering overhead. There are many activities to keep you engaged while we’re at sea. You can take advantage of the library of books available on your ship, chat with your shipmates at the bar, or spend time out on deck, admiring the sea. Your Expedition Team will also conduct a series of presentations to familiarize yourself with how to prepare for Zodiac cruises and shore landings. The Falkland archipelago contains two main islands, East Falkland and West Falkland, which you will explore thanks to Zodiac excursions and daily landings. These rugged islands have a frontier feel to them. This is especially true of the largest settlement, Stanley, an interesting British outpost–type place, where you could just as easily wander into a pub as you could a church or museum. Have your camera handy, as your wildlife sightings in the Falklands (Malvinas) should include at least three species of penguins, plus two endemic bird species—Cobb’s wren and the Falkland’s flightless steamer duck. Your team of lecturers and specialists will be sure to educate you on the local flora and fauna so that you have the most memorable time. En route to South Georgia, you’ll cross the Antarctic Convergence, an invisible biological boundary unique to Antarctica. This meeting of oceans is what creates the abundance of krill and marine life that attracts large cetaceans, such as humpback whales, to the area. Evidence of the old whaling and sealing heyday is still found throughout the island. You’ll be surprised to learn that whale and seal populations were once decimated here. Today, their populations are strong, with massive rookeries to be seen. One significant and historic site that will be of interest is the grave of the great explorer Sir Ernest Shackleton. Your visit to his gravesite at the Grytviken settlement, also home to an old whaling station and a research station, is a day for reflecting on what it must have been like to be one of the first explorers of this unforgiving yet beautiful environment. Although South Georgia’s history is an important attraction to the island, it is the wildlife that you and your shipmates will likely find most captivating. Often referred to as the Galapagos of the Poles, South Georgia contains an exceptional quantity of wildlife. Each landing you make on the island will open your eyes to a new wonder: one day you may see rookeries with hundreds of thousands of pairs of king penguins waddling on a beach; the next day you may visit another beach dotted with thousands of fur or elephant seals. The grasses, mountains and beaches of South Georgia all play an important role in the breeding and survival of different bird and animal species. Your Expedition Team will be happy to share its knowledge of how these vulnerable relationships all play out on the island. Antarctica awaits, along with its own penguin and seal species. While you’re at sea, you can enjoy quiet time or take in presentations by your Expedition Team, who will cover everything from the history and geology of Antarctica to tips on identifying different species and what makes each of them unique. The experience is hard to put into words, but the most common reaction upon reaching the White Continent is a sense of reverence and awe. The experience is hard to put into words. You will discover that Antarctica is a land of extremes: at one moment you’ll be overcome with a feeling of complete silence and loneliness, and the next moment you’ll be laughing at the comical antics of a curious penguin. Glacier hikes, visits to research bases and, of course, communing with seals and penguins are sure to keep you smiling every day. Perhaps you’ll catch sight of the fearless penguin eater, the leopard seal, or maybe you’ll come eye to eye with a curious minke whale while you are cruising in a Zodiac. Each day and each landing will present a new collection of creatures to entertain you and keep your camera busy. If you find yourself wanting more, then perhaps you’ll treat yourself by booking our kayaking Adventure Option (reserve in advance when booking your trip); if you’re feeling a bit overwhelmed, a little shock therapy courtesy of a Polar Plunge might be what you need! Crossing the Antarctic Circle is an impressive achievement, as most expeditions to the Antarctic Peninsula do not come close to reaching this far south. If conditions allow us to cross this famed line, we'll toast the first explorers who ventured here, and you can raise a glass of champagne and take pride in knowing you’ve made it to a part of the world visited by very few people. This is raw Antarctica, home of the midnight sun, where there is the potential for fantastic iceberg sightings. If you haven’t had your fill of Antarctic wildlife and icebergs by now, you’ll surely be satisfied by the time you return to the Drake Passage. You will continue to journey onto land by Zodiac twice daily as you travel north along the western Antarctic Peninsula. Your Expedition Team will always be on the lookout for species of penguins, seals and whales that may have eluded you on your journey south. After more than a dozen days of memorable wildlife encounters, your journey home begins. Crossing the Drake is your unofficial rite of passage, putting a final stamp of approval on your Antarctic adventure. Today you’ll say goodbye to your Expedition Team and fellow travelers, disembarking in the morning to catch your homeward flights. With a maximum of 210 passengers, the Ocean Diamond offers cabins across its five decks. There a range of cabins and suites available and all feature outside views (porthole, window or balcony), full private en-suite bathrooms featuring bathtub and shower, a writing desk, individual temperature control, in-room safe, refrigerator, satellite phone access, hairdryer and flat-screen television and DVD player. Cabins range in size from 17 square metres to 30 square metres. The vessel complies with all MARPOL (Marine Pollution Act)regulations. The vessel has a Garbage Management Plan to deal with garbage accumulated during a voyage. As for human waste, the vessel is equipped with a Sewage Treatment system that processes the waste generated onboard. The treated waste water is discharged at sea or shoreside. If discharged at sea it is done according to strict International standards and Class required protocols that include distance from shore, depth of the water, speed of the vessel and rate of discharge. • On board lecturers and educational presentations from Polar specialists. Get to know the island of “fire and ice” in autumn on this special journey that gives the opportunity to witness Northern Lights and different species of whales. Look forward ......click here to read more. Experience an unforgettable journey around Iceland onboard the OCEAN DIAMOND. Discover this mystical land steeped in Viking traditions and volcanic landscapes rarely seen anywhere else on earth. This voyage reveals ......click here to read more.